SPD Chief Frank Straub: "We're not going to tolerate abhorrent behavior in this police department." Spokane Police Chief Frank Straub calls it a “re-engineering” process. Throughout the past 12 months under his leadership, the Spokane Police Department has seen shake-up after shake-up, reworking everything from command structures to patrol strategies to vehicle decals. From top to bottom, Straub has replaced his entire executive staff. Officers of all ranks have shifted to new assignments and gone through expanded training. The department has updated how it tracks and responds to crimes throughout the city. Heading into his second year, Straub expects to continue a restless pursuit of reform. Walking into a barrage of expectations last fall, Straub has weathered his first year well. While many local critics consider the department’s recent reforms long overdue, most community advocates have praised Straub’s efforts to repair the bitter relationship between the city’s police force and its citizenry. Straub has pushed new community outreach programs. He has embraced interagency partnerships and new accountability standards. He has lobbied for additional staffing and equipment. All while so far avoiding much of the scandal and dysfunction that plagued other recent administrations. “I think he’s done a great job considering the challenges he got himself into,” says Rick Eichstaedt, director of the Center for Justice, one of the department’s strongest critics. But many other challenges remain. Ongoing negotiations with the Spokane Police Guild have complicated efforts to adopt additional reforms. Crime rates throughout Spokane continue to run well above those of similarly sized cities. High-profile murders and multiple officer-involved shootings have captured headlines and shaken nerves. And despite the department’s recent efforts to target downtown crime, business closures and public fears persist over renewed reports of street disorder and youth violence. “We have a lot of work to do,” Straub says. When Straub first took over the Spokane department in 2012, nine out of every 100 city residents could expect to be victims of a property crime. As most major cities across the country enjoyed falling crime rates, Spokane saw its property crime rates rise 13 percent in the years since 2000. Department crime records show citywide property crimes continue at about 5.5 percent above last year, with those numbers varying widely throughout different parts of the city. Meanwhile, violent crimes, such as murder or robbery, have dropped by about 4.9 percent compared to 2012. Straub attributes most of the city’s property crime, including the notorious vehicle theft rates, to drug addiction. The city’s northeast region, encompassing areas north of the river and east of Division, has endured a 17 percent rise in property crime this year. In May, Straub himself became a victim when his bicycle was stolen from his garage on the relatively safe South Hill. The downtown business core has struggled with its own issues. Beignets restaurant and the Blue Spark bar both closed in the past year, blaming loiterers and “street kids” for driving off customers. The Blue Spark in particular accused the police of ignoring its concerns. Driven by anecdotal observations and persistent TV coverage, downtown visitors have voiced uneasiness regarding late-night assaults, aggressive panhandling and other disruptive behavior. Straub argues he has worked closely with local businesses and the Downtown Spokane Partnership to increase the police presence in the city’s core and address problems. He advocates a collaborative approach, with community service providers teaming with street officers to move beyond just arresting troublemakers. Looking at the numbers, Straub argues the department has made significant headway downtown, helping drive down violent crime by 12 percent compared to last year. Property crime has also dropped 1.5 percent. The West Central and eastern South Hill neighborhoods also have seen decreases. Spokane Mayor David Condon, who brought Straub in to be a reformer and innovator, says his administration is dedicated to supporting Straub’s efforts to curb out-of-control property crime. Straub notes the department does not have any open homicide cases. Investigators have arrested strong suspects in all of the cases this year, he says, adding he plans to continue shifting patrols and personnel in hopes of disrupting some of those crime increases. He says a budget proposal to add 25 new police officers also would help. In his efforts to redefine the Spokane police, Straub says one of his most difficult tasks involved familiarizing himself with the tangled and troubled history of the department. Straub says he found a city and police force traumatized and divided over the 2006 death of Otto Zehm. Within weeks of arriving in Spokane, Straub saw former Officer Karl Thompson sentenced to more than four years in prison for excessive force in the case. Overall, Eichstaedt says the Center for Justice and other community groups have been pleased with Straub’s efforts to seek public input and partnership. He says Straub has proven to be accessible and open to new ideas. Police officials now seem interested in innovation and adapting to best practices. Eichstaedt says Straub has voiced support for increased civilian oversight and other accountability programs, such as the introduction of officer-worn body cameras. He also has expanded training certification requirements and sent supervisors to other departments for cross-agency training. Logistically, Straub also has dramatically changed how the department monitors and reacts to crime throughout the city. Based on his experience in Indianapolis and White Plains, N.Y., Straub has shifted the department to a CompStat enforcement model, which uses crime data to strategically assign patrol officers to crime “hot spots” in different neighborhoods. The CompStat approach also includes weekly meetings between the SPD and other regional agencies to share intelligence on crime trends and repeat offenders. Frank Harrill, supervisory senior resident agent with the Spokane office of the Federal Bureau of Investigation, says Straub has emphasized the importance of collaboration, strengthening the already close working relationship between federal and local jurisdictions. Despite the department’s progress, Straub has encountered a few personnel and minor media scandals similar to those that dogged previous Spokane police chiefs. The most prominent of those may have been the internal investigation and eventual $190,000 severance settlement with former Assistant Chief Scott Stephens, a 27-year veteran of the department. Meanwhile, longtime Officer Timothy Moses resigned in May after pleading guilty to lying during the Zehm investigation. Two other officers, Jeff Graves and Darrell Quarles, faced misconduct investigations. Graves resigned, while Quarles was suspended for two months. Straub says he has not fired anyone during his first year. He notes the department is also introducing a new “early warning” program in Internal Affairs to help identify officers who may be having personal problems that could interfere with their job performance or judgment. In August, Straub was condemned by national media outlets in the wake of the beating death of World War II veteran Delbert Belton, allegedly at the hands of two teens. Quickly distorted with racial overtones, Straub says national pundits twisted the story to fit their agendas while local outlets stuck to the facts. With police guild negotiations stretching longer than a year and a half, community groups have also voiced frustrations over whether the drawn-out talks are delaying important reform efforts. Straub says he believes the negotiations are coming to an end, saying the guild has a responsibility to its members. He describes the guild leadership as “good partners” who challenge him to carefully evaluate new policies or programs. Officer John Gately, the guild president, says the union has a good working relationship with Straub’s administration. Gately says the chief has shown he respects the guild’s perspective and fought for the additional officers the department needs. “He lets people do their jobs,” Gately says. As Straub stood before the city’s Use of Force Commission in August, commission Chairman Earl “Marty” Martin commended him on the department’s progress during the first half of this year. As someone who has drilled down into some of the institutional problems of the Spokane department, Martin says he appreciates Straub’s dedication to improvement. “He’s clearly taken our recommendations very seriously,” Martin says now. Martin says he and other members of the commission have been pleasantly surprised by the steps Straub has taken to improve training, transparency and accountability. Martin says some of the reforms won’t be “quick fixes,” but Straub has moved the conversation back into a positive and constructive dialogue between the department and the community. The Spokane Police Department expects to undergo additional outside scrutiny later this month as the Department of Justice launches its Technical Assistance Review of the department and its use-of-force protocols. Spokane officials announced the federal review earlier this year, but Joshua Ederheimer, acting director of the DOJ’s Office of Community Oriented Policing Services, says the funding did not come through until last week. Ederheimer says Straub requested federal experts examine the department’s use-of-force policy, its officer-involved-shooting protocols and its de-escalation practices. The review will not re-investigate any cases, but will look for trends that indicate potential issues. Only one other department, the Las Vegas Metropolitan Police Department, has undergone this type of review. Ederheimer calls the process a collaborative, “proactive” approach to evaluating a department’s policies. He expects the review to take several months. Spokane Police Ombudsman Tim Burns has watched the department evolve in the years since his office was created in response to the Zehm controversy. While he waits to see what the city will do with the Proposition 1 effort to expand the investigative powers of his office, he says he remains encouraged by Straub’s start. Looking at 2013, Burns says citizen complaints against the department have continued to tick up, averaging about 21 each month through August. Reported incidents of officers using force have also held steady compared to recent years. But Burns sees the tide shifting. “[Straub] needs to continue down the path that he and the police department are headed down,” Burns says. Straub says that’s his plan. He wants to keep adapting and moving toward improvement. In the coming years, he wants to hire more officers and build toward a precinct policing model that could locate multiple substations throughout the city. He wants to strengthen the initial bridges he has built with the community and incorporate new technology into crime-fighting efforts. He wants Spokane to become an example that other departments look to for inspiration. Throughout Frank Straub’s year in Spokane, he has continued to make headlines in Indianapolis, where his short term as public safety director left him entangled in ongoing legal battles and a new dispute over its Regional Operations Center. Indiana media outlets have aggressively covered Straub’s handling of an investigation into David Bisard, an officer with the Indianapolis Metropolitan Police Department accused of killing a motorcyclist in a drunken driving crash in 2010. Reports from the Indianapolis Star, Fox 59 News and other outlets say Straub oversaw many aspects of the investigation personally. Officials have testified Straub had investigators secretly record interviews and download emails. After the crash, one of two vials containing samples of Bisard’s blood went unrefrigerated for five months before testing, calling into question the management of the case. Bisard’s criminal trial starts Oct. 14, with Fox 59 reporting Straub is listed as a potential witness. When asked if he expected to testify, Straub said he would wait and see if that becomes necessary. In a blow against one of Straub’s proudest accomplishments, the city’s Regional Operations Center also closed last month for emergency maintenance. The multi-agency center, which houses IMPD headquarters and offices for other public safety operations, was forced to evacuate staff amid concerns the building could be unsafe. Straub spearheaded the development of the center in 2011 as part of the city’s preparations for its hosting of the Super Bowl. With the new maintenance concerns, the city faces a potential lawsuit over repair costs associated with its 25-year lease on the building. The Indianapolis police union, an outspoken critic of Straub, has called for an investigation into the matter. While he has monitored the issue, Straub says he believes the conflict will come to a reasonable resolution. He says he remains pleased with how the center facilitated the integration of security efforts surrounding the Super Bowl, and he expects future news stories to clear up the dispute. Sept. 10, 2012: With support from Mayor David Condon, the Spokane City Council approves Frank Straub as director of law enforcement, a temporary position until he can be commissioned and sworn in as police chief. Oct. 8: Condon swears in Straub as police chief. Oct. 15: The City Council approves a $350,000 settlement with Det. Jeff Harvey, apologizing for his temporary termination over a confrontation with a Fish & Wildlife officer. Oct. 23: Condon and the City Council approve extending the contract for Police Ombudsman Tim Burns. His contract has since been extended again until August of 2014. Nov. 15: Former Spokane police Officer Karl Thompson is ordered to serve more than four years in prison for excessive force during the arrest of Otto Zehm (pictured) in 2006. After being struck with a baton, hogtied and Tasered repeatedly, Zehm died in police custody. Dec. 19: Assistant Police Chief Scott Stephens allegedly makes a threatening comment after being told he will be demoted to captain. Straub puts him on administrative leave the following day, pending an investigation. Dec. 20: After a year of public input and evaluation, the city’s independent Use of Force Commission releases 26 recommendations for reforming the culture and operations of the Spokane Police Department. Dec. 21: Straub announces a new department-wide strategic plan and reorganization of the command structure, including demotion of Stephens. Feb. 5: A Spokane police officer shoots and kills 52-year-old Jacob I. Dorfman, who was armed with a handgun during an early morning confrontation on the South Hill. The Spokane County Prosecutor’s Office later finds the shooting justified. Feb. 12: Spokane voters overwhelmingly support Proposition 1 to give the police ombudsman independent investigative authority and establish a Police Ombudsman Commission to provide additional civilian oversight of the police department. Feb. 18: Straub orders the closure of the Knitting Factory music venue in the wake of two shootings and other disturbances originating at or near the concert hall. It reopens a few days later. March 25: Northeast Spokane resident Gail Gerlach shoots and kills suspected car thief Brendon Kaluza-Graham as he drives away in Gerlach’s SUV, splitting the community over self-defense rights. Gerlach now faces a charge of first-degree manslaughter. April 15: City Council approves $1.1 million in additional spending for officer cameras, equipment and training to help the department implement the recommendations from the Use of Force Commission. April 26: City officials announce a $190,000 settlement with Stephens, who resigns after 27 years with the department. May 7: Officer Darrell Quarles is placed on administrative leave pending an internal affairs investigation. Quarles is later suspended for two months for “associating” with a woman with an extensive criminal history. May 7: Officer Timothy Moses pleads guilty to lying to federal agents during the Otto Zehm investigation and resigns. A judge sentences him to 12 months of probation and a $2,500 fine. May 9: Officer Jeff Graves is placed on leave over stalking allegations. Graves later resigns. May 16: Spokane officers shoot and kill 21-year-old Justin Cairns at his home in Nine Mile Falls. Cairns (pictured) was a suspect in a fatal shooting earlier in the evening. The shooting remains under review. June 27: The Spokane Police Department opens a small substation along Riverside Avenue in downtown to improve community access and police presence. June 27: SPD launches Spokane Police Youth Athletic League basketball program at Liberty Park, pairing officer and community leaders with at-risk youth for weekly games. Aug. 6: Condon releases a preliminary budget recommending the hiring of an additional 25 officers. Aug. 21: Straub highlights new reforms while delivering a six-month update for city’s Use of Force Commission on the department’s progress. Aug. 21: World War II veteran Delbert Belton (pictured) is beaten to death in North Spokane, launching a multi-day manhunt for two suspected teens and sparking national controversy. Aug. 22: Spokane officers shoot and kill 40-year-old Danny C. Jones outside the Salvation Army. The shooting remains under review. Sept. 23: City Council approves $730,000 of its previously allocated $1.1 million to purchase 220 officer-worn body cameras and upgraded Tasers for the department. 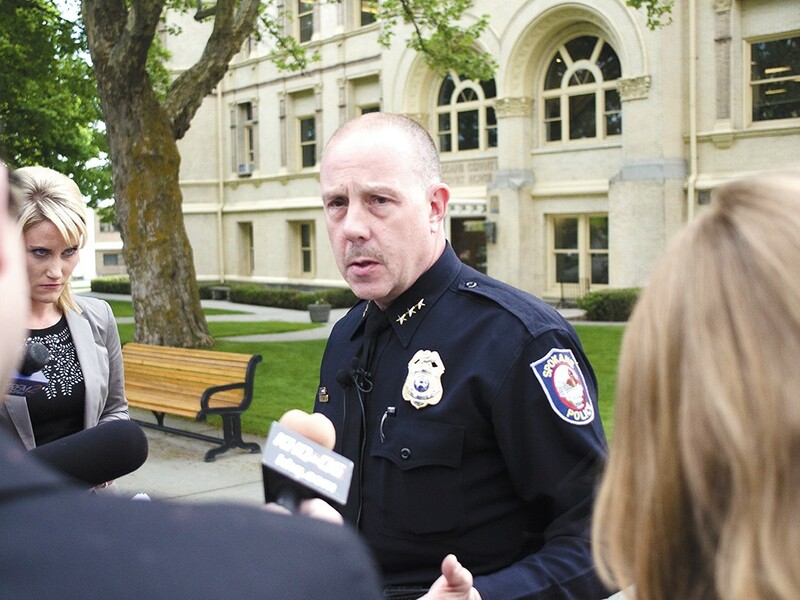 Some more of Straub's thoughts on Spokane, SPD changes and future goals.